Inaccessible shelters, untrained shelter staff and limited services and resources created unnecessary challenges for people with disabilities during and after Hurricane Florence. Disability Rights North Carolina, the state’s disability rights monitoring group, released a report in February describing these findings. Advocates are now working to elevate the voices of people with disabilities and their caregivers to ensure that their needs aren’t overlooked when planning for the next disaster. Terry Helvie and her two adult children left their home in Pamlico County to seek shelter in New Bern a few days before Hurricane Florence collided with the state’s coast. Helvie’s 26-year-old son Logan is nonverbal and has severe autism. She says that’s why they chose to stay at a hotel. “He has fear of large groups of people. He has a fear of people he doesn’t know. He has fear of darkness,” Helvie said, speaking at a disability rights forum. Helvie says she tried to protect her son from triggers that could send him into a meltdown. They stayed at the Bridgepoint Hotel in New Bern for a couple of days. But then the building started to flood. They were evacuated to an emergency shelter at a nearby elementary school and were given their own room. Helvie says her son remained calm at the shelter inside the school. But that changed at the next shelter. They were placed in a room with people they didn’t know. One night, a shelter worker turned off the lights. Helvie says she begged for a night light, but the staff member on duty told her no. She says her son couldn’t sleep that night, and the next morning he had a meltdown. Helvie says her son was admitted at a nearby hospital. A nurse put him to bed and dimmed the lights. He slept through the night and was discharged the next day. Disability rights advocates helped the family find a hotel and temporary housing. But Helvie says her son hasn’t readjusted since his meltdown at the shelter. Helvie’s story was included in a recent report from Disability Rights North Carolina. CEO Virginia Knowlton-Marcus says they’ve been working with state emergency management officials to try to get better accommodations for people with disabilities in a disaster. 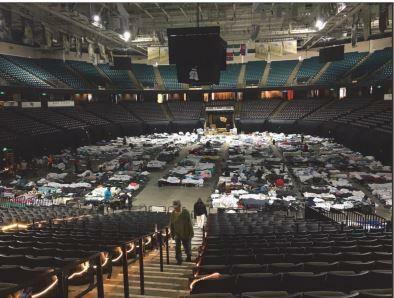 Knowlton-Marcus says disability rights investigators also discovered inaccessible shelters after Florence, such as Winston-Salem’s Colesium. Disability rights advocates are calling for more input from people with disabilities and their advocates in the disaster planning process. Marcie Roth leads the Partnership for Inclusive Disaster Strategies. Her group backs the READI for Disasters Act, which was introduced in Congress last year. Roth says in the midst of Florence recovery she sees opportunities at the state and local levels to better accommodate people with disabilities in future disasters.